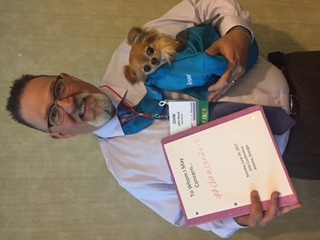 Between June 25 and 27, 2017, I had the pleasure of attending the Re-Imagine Life with Dementia conference, sponsored by Dementia Action Alliance (DAA) and held in Buckhead, GA, just outside of Atlanta. 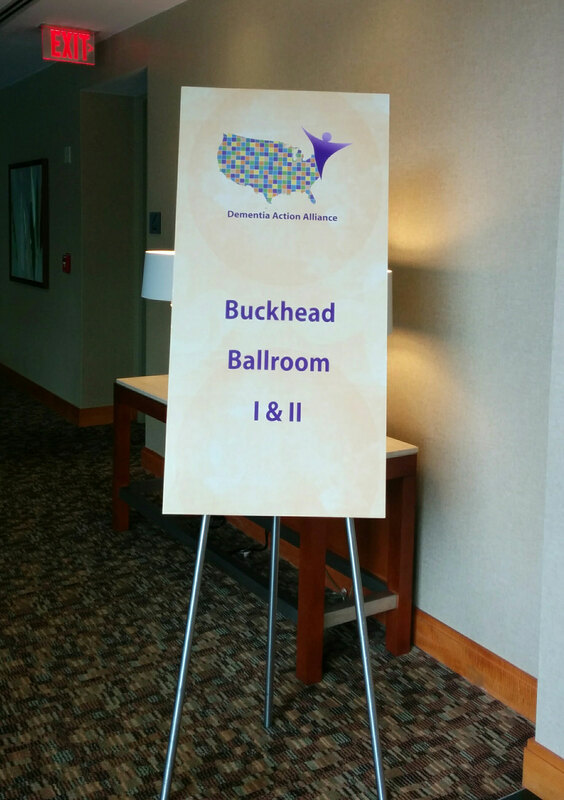 As part of the Planning Committee for this conference, I knew ahead of time that it would be special. 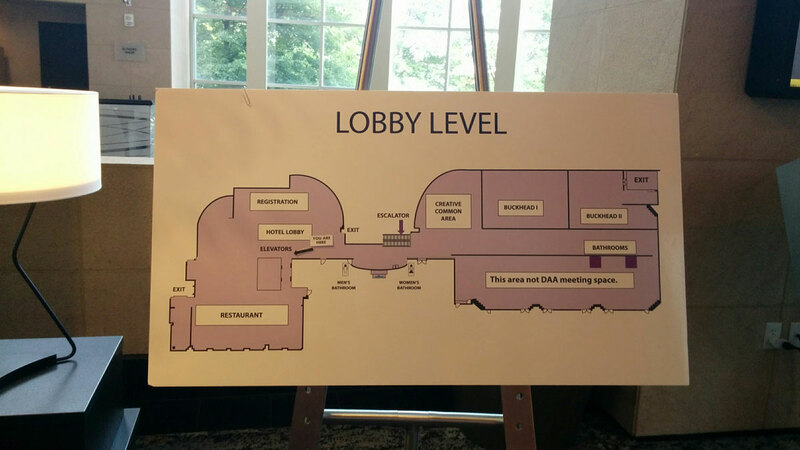 We set out to make the kind of conference that we would want to attend, and it was. 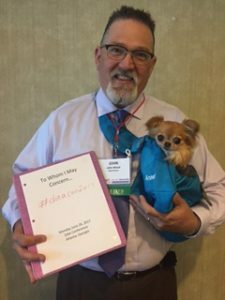 Given that DAA’s mission is “The DAA is a diverse coalition of passionate people creating a better society now for individuals to LIVE with dementia,” one could be assured that this would be a unique conference. Sure enough, the conference included an unprecedented number of people living with the symptoms of dementia and their care partners. 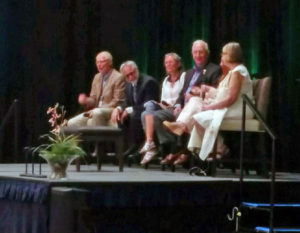 As per the conference title, workshops and keynotes were focused on re-imagining LIFE with dementia–not life someday or life with a cure, but life NOW. The conference began and ended with a panel of people living with dementia, chaired by Dr. Al Power. The first keynote speaker was Brian LeBlanc, a smart, creative, entertaining man who happens to be living with a diagnosis of Alzheimer’s disease. Workshops and keynotes were interactive; indeed that was a criteria for acceptance to present at the conference. As such, the degree of engagement between audience and speakers, and between workshop participants was high. Lunchtime tables where discussions were centered around predetermined topics maintained that level of engagement, as did the Town Halls that ended each of the two days. In short, we all had plenty of opportunities for conversations about re-imagining life with dementia–changing the story of dementia–and we did. But more importantly, the conference served to establish a new image of dementia. In re-imagining life with dementia, we also re-imagined what someone with dementia looks like, and, as you know, a picture is worth a thousand words. 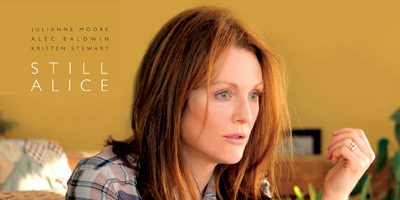 What Is the Prevailing Image of Dementia Today? What strikes me about these images is not so much the look of confusion or sadness or frustration. For sure all people with dementia experience these emotions and may look like the people in these pictures at times. But that’s not the whole story. That’s not their entire life. 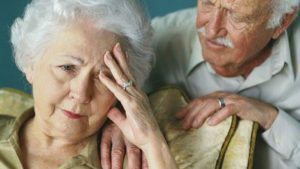 The people living with dementia portrayed in stock images or in media shots are either alone or alone with a caregiver, who looks very intense, troubled and concerned. I poked around a bit on the Internet; even those few people who were supposed to be portraying a person with early onset dementia (again, stock images) and who looked fairly upbeat, were alone. The message? Isolation. It’s a lonely disease. You never see people with dementia portrayed as normal people with disabilities associated with dementia, supported to live normal lives. 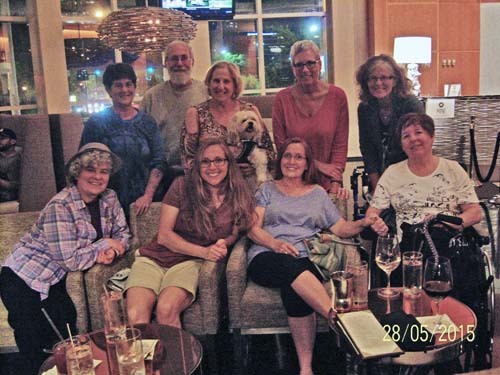 As such, photos like the one below are rare, perhaps because opportunities to get together and be “normal” are few for people with dementia. 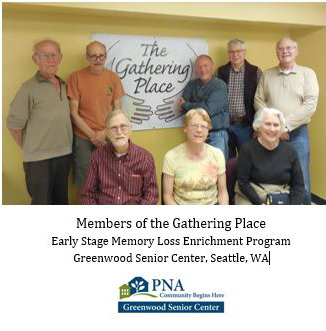 Kudos to the Gathering Place members, all living with a form of dementia, for deciding to write a letter to those newly embarked on the dementia journey, and including this photo of themselves. And no, they don’t “look” like they have dementia, do they? And there’s more than one person, with nary a care partner in sight. So what has this all got to do with the Re-imagine Life with Dementia conference? As I mentioned, an unprecedented number of people living with the diagnosis attended, along with care partners and service dogs. 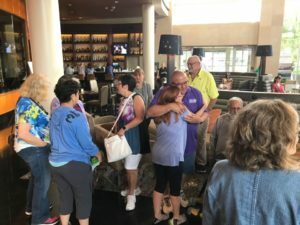 I’m sure that statistically there must be some tipping point, where if there is a certain percentage of people as part of a larger group, they cease to be “special.” If so, that tipping point must be around 10 percent, because 10 percent or so of the attendees at this conference were people with dementia. And while they were each special in their own way, they weren’t SPECIAL. Yes, there was a quiet room. 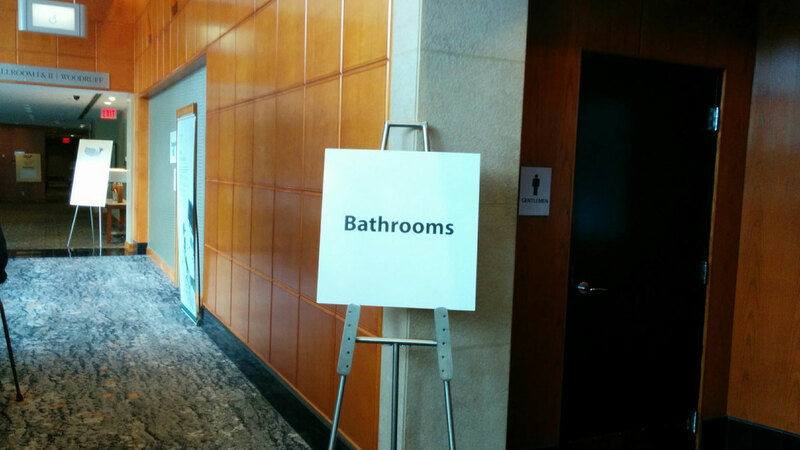 There was also fabulous signage. There were people to help. Can you spot the person with dementia? Signs like these were everywhere. 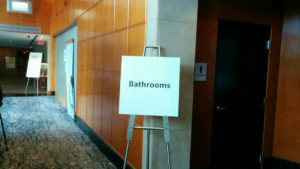 But because people with dementia were fully supported in attending the conference and participated either as presenters or participants in every workshop and keynote, along with the special interest groups, town halls, the opening reception, and the comedy night, they ceased to be “special”–they ceased to be “they” and there was no “us and them.” No one was asking, “does he or doesn’t he” because we didn’t care. Again, you’d have to pick out those with dementia. But really, does it matter? 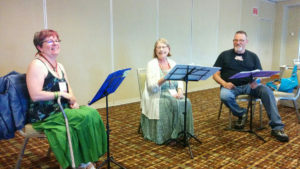 The “To Whom I May Concern®” performing group: Tammy Bellamy, Paulan Gordon, John Wood. Opening panel discussion: Brian LeBlanc, Phyllis Fehr, Robert Bowles, Susan Suchan and Paulan Gordon. And Dr. Al Power as moderator. So, what does dementia really look like? If more images like the ones above made it out into the media, what message would that send? To me, the message is one of survival, hope, possibility. People with dementia are a part of us, a part of our social network, our community. Our friends, our neighbours. Depressing images of hopelessness, sadness and confusion send messages of fear and of “them-ness.” Not part of us, not part of our communities. Isolation is normal and to be expected. 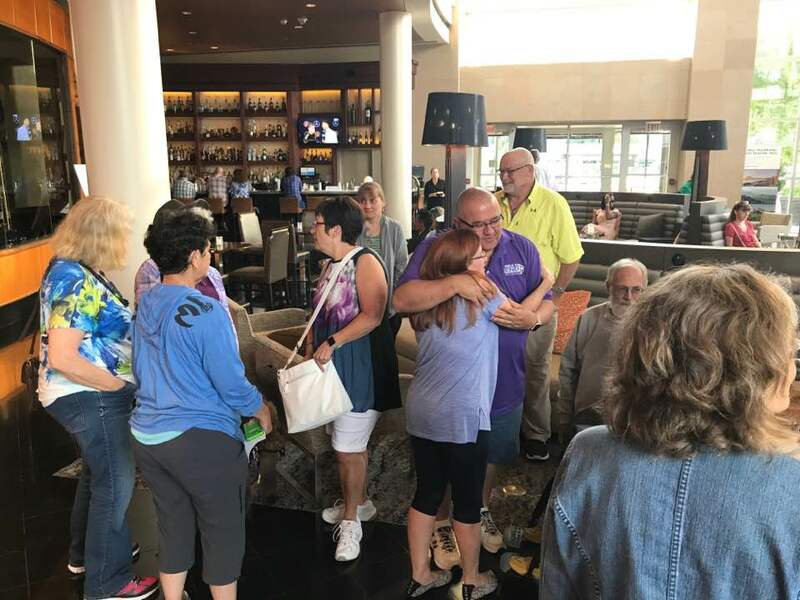 Having just a few people with dementia at a conference sends a message of “Special” and “them.” Having just a couple of presenters with dementia makes them out to be oddities, a side show. 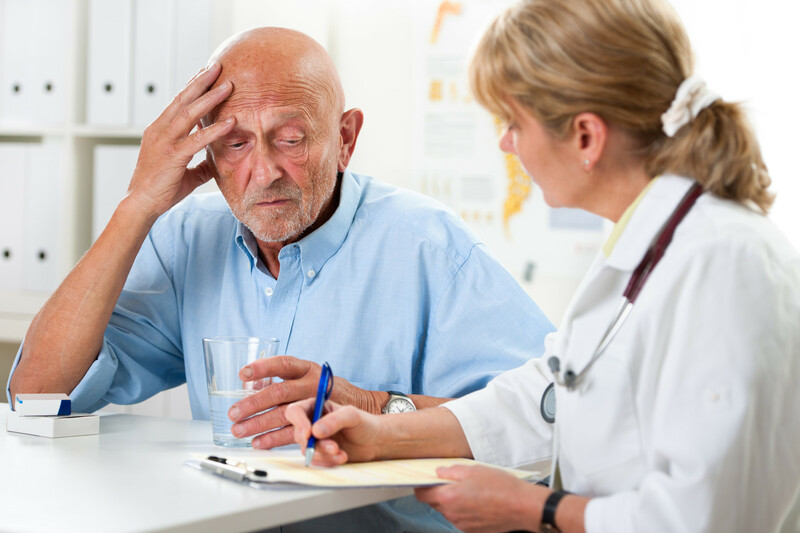 Seeing just a few people looking like they “don’t have dementia” doesn’t have much impact and in fact causes them great pain in that by putting themselves out there, their diagnosis becomes public property in an effort to prove they have dementia. Supporting 10 percent of your conference delegates in attending ALL sessions and entertainment sends a message of inclusiveness to the point that we stopped thinking about who was who and who wasn’t dealing with what. Having a mass of people with dementia all looking and acting like they “didn’t have dementia” meant that the old image in our minds began to be replaced. THIS is what dementia looks like. They were just Brian, Cecile, Susan, Tammy, Phyllis, Robert, John, Paulan, Tru, Robert, etc. etc. That’s where we as a society need to get to. Let’s work hard at getting a mass quantity of images like these out in front of the public eye until we reach the tipping point where the old, worn out images of dementia in the public mindset is replaced with a more hopeful, less lonely, more REAL image. Let’s start showing the truth about dementia, and in particular, the experience of early stage dementia. Doing so, and I hate to say this, “humanizes” dementia. Let’s change the story by changing the image. A picture is worth a thousand words. The Re-imagine Life with Dementia conference was a great start. What else can we do? I welcome your comments and suggestions. And I just want to point out: I was the only person to lose my cellphone at the conference. Thank you John and Carol for finding it! P.S. For all of you who are simmering in rage and ready to hit “Unsubscribe” because my words and these positive images do not reflect your experience with your loved one with dementia, let me say this. My words and these images do not reflect my experience with my mother either. I was so vested in the prevailing story of dementia that I had my head so far in the sand that I completely missed the part where, with proper support, her reality would have been more like these photos. Thanks for this important message, Laura. Well said, and I agree wholeheartedly. I didn’t know enough when I cared for my mother with dementia (d.2006). I’m trying to make it up to her by making a difference in my community. 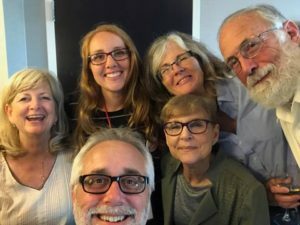 Using the “Giving Voice Chorus” in St. Paul/Minneapolis as a model, and kudos to them for generously sharing their free “Toolkit” with tips on how to start a similar group. I started the initiative in Arlington, TX, and we will start rehearsals for the “Musical Memory Singers” here in September for people with early/mid-stage dementia, their care partners, and volunteers. Some very experienced musicians have stepped forward to lead; volunteers from the U. of Texas at Arlington have stepped forward to help; Pantego Lion’s Club lets us use their venue for free. It’s going to be fabulous. And thanks to my friend, Judy Van Norman who recently started the “Together in Song” group in Houston where I first heard about this. Check out the Giving Voice Chorus by searching YouTube or the web! Thank you Elva! 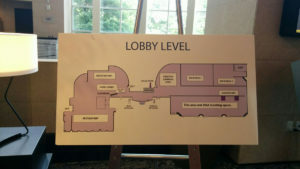 Perhaps the group would consider coming to the next Re-imagine Life with Dementia conference and doing a presentation! Wonderful presentation, I’m dealing with a spouse with dementia and getting worried about myself! 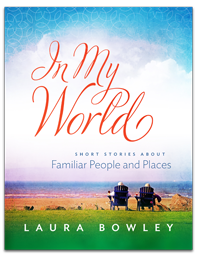 Lots of stress and needing to relate to others who share my problems and want to share! Thanks, again! Yes, I agree, and I was thinking along exactly the same lines. I thought it would be great to create a series of posts headlined and tagged “The Face of Dementia,” which would feature exactly the kind of photos you’re talking about. Do you want to collaborate on it? Hi Susan: It’s already in place on Facebook, essentially, My Dementia Story. See https://www.facebook.com/mydementiastory/. Jan Ford was wonderful in helping me collect photos and stories. I’ve wanted to make a website of it for ages though. I’d love to collaborate, just don’t have a ton of time. This sounds like a great experience Laura. I wish I had been there with you! But I was in Worcester for 10’days thanks to an invitation from Dawn Brooker to photograph the work of her wonderful doctoral and post-doctoral students . I accompanied 6 of them to the sites of their work on the power of the arts in dementia care. On Wednesday evening I was able to show a new 100 photos of art and music programs at the conclusion of a public lecture I gave using prior photos from the last 15 years of my work to do just what you are advocating. I thought of you often on that trip and will send you some new image when I have time to edit them. Advocates like you for the power of photos are soooo important to those of us trying to make those images! I love my folks living with dementia and try to treat them with dignity at all times!